I have been collecting up a few little travel minis to take away with me on my flight to Thailand. It will take me around 24 hours from leaving the UK to arriving in Bangkok so I thought having a few little luxuries would make it a bit more bearable. Obviously these are a must have to stay nice and clean. I always like to wipe down my little tray table 'cause you just never know who was sat there before you. Also I'm very prone to nose bleeds when flying so tissues are a must for me. Im sure after 24hours of travelling I will be pretty stinky so these wipes will come in very handy! The perfume is just a little luxury to make myself feel a bit better. Fresh breath is a must! I will be taking a tooth brush along too obviously. This is to go along with my moisturiser as I will want to cleanse my face throughout the flight too. Plus I will need to take up the little make-up I may put on before my flight. How cute is this tiny hair brush! I always tie my hair up on a flight, it drives me mad to have it in the way making me hot. Im not sure I am 100% taking the makeup items along with it being such a long flight I probably won't be bothered at the other end however the lip balm is a must. I suffer with really bad ear ache when on flights so I really need to take along some paracetamol to help ease it. they always come in handy for head aches etc. Im also taking to tablets of my medication incase I need it. Again these are just a few nice little luxuries that I have just popped in their to try out. 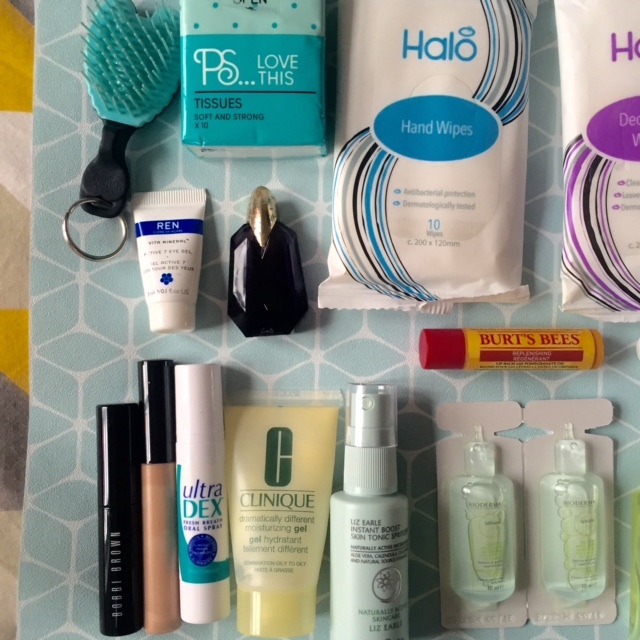 I am popping all the liquids in to a clear plastic bag and then putting it all inside a small toiletries bag. 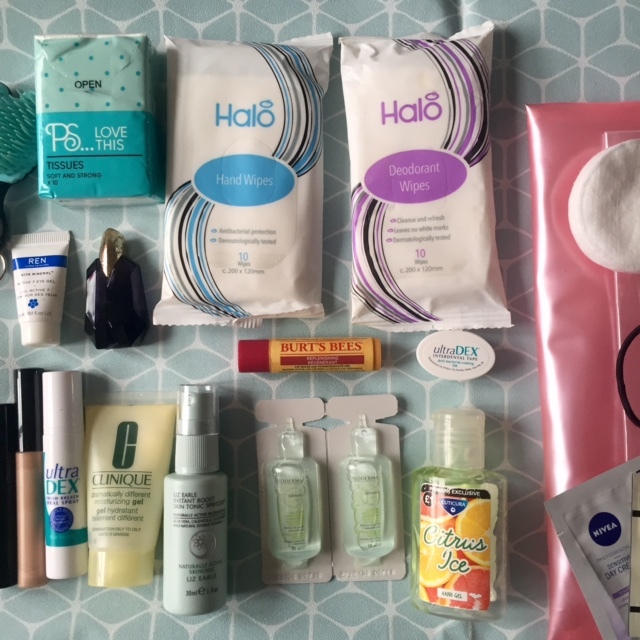 Things that where not photographed that I will be taking along as well include a hand moisturiser, roll on deodorant, tooth brush and mouth wash. 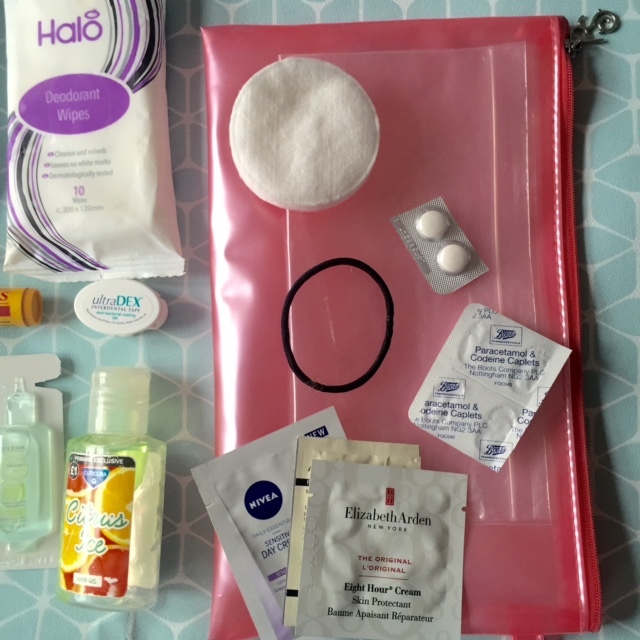 I hope this post comes in hand for when you are packing your in flight carry on bag! Is there anything else you would add?